Our passion for serving our Clients’ customers extends across the entire journey each customer has with the brand. Percepta’s Concierge and Inquiries Management services were designed specifically to help those at the very beginning of this journey, when prospective customers are seeking advice or a helping hand before making that all important purchase. 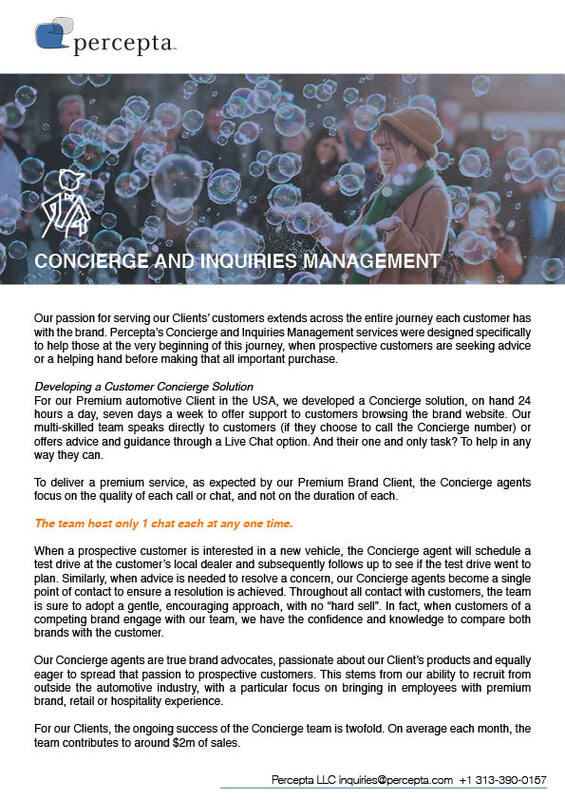 For our Premium automotive Client in the USA, we developed a Concierge solution, on hand 24 hours a day, seven days a week to offer support to customers browsing the brand website. Our multi-skilled team speaks directly to customers (if they choose to call the Concierge number) or offers advice and guidance through a Live Chat option. And their one and only task? To help in any way they can. To deliver a premium service, as expected by our Premium Brand Client, the Concierge agents focus on the quality of each call or chat, and not on the duration of each. When a prospective customer is interested in a new vehicle, the Concierge agent will schedule a test drive at the customer’s local dealer and subsequently follows up to see if the test drive went to plan. Similarly, when advice is needed to resolve a concern, our Concierge agents become a single point of contact to ensure a resolution is achieved. Throughout all contact with customers, the team is sure to adopt a gentle, encouraging approach, with no “hard sell”. In fact, when customers of a competing brand engage with our team, we have the confidence and knowledge to compare both brands with the customer. Our Concierge agents are true brand advocates, passionate about our Client’s products and equally eager to spread that passion to prospective customers. This stems from our ability to recruit from outside the automotive industry, with a particular focus on bringing in employees with premium brand, retail or hospitality experience. For our Clients, the ongoing success of the Concierge team is twofold. On average each month, the team contributes to around $2m of sales. However, their value extends far beyond the financial gain. The work carried out by the Concierge team in going above and beyond allows them to develop and sustain truly long term relationships with customers. Percepta LLC specialize in creating customer loyalty for their clients across the globe. Delivered in multiple channels, speaking multiple languages, we bring over 16 years of customer service experience across each market we support.